Youth Combat is an exciting program for SCA youth ages 6 through 17 to participate in a kid-friendly and safe version of adult combat. The program emphasizes courtesy, honor and service as well as safety. Boys and girls participate in combat together, separated only by age, not gender. 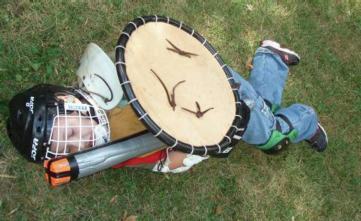 Youth armor and weapons standards vary by division, but generally parents can armor their youth fighters with standard athletic gear like elbow and knee pads, hockey helmets and hockey gloves. Weapons are made of 3/4" to 1" rattan covered in foam padding and duct tape for all Divisions. Rattan for youth combat is available from the youth marshal at cost, typically about $15 per 9-ft. stave, which will make three swords or one sword and one great weapon (polearm or great sword). Instruction in building armor and weapons is available from the youth marshalls, or check out the links below for more information on armor and weapons construction. A youth fighting waiver must be completed for children to participate. The youth marshalls will teach parents and youths the rules and techniques that must be followed to participate safely. At SCA events, youth fighters participate in tournaments and melees with other youth, just as their adult counterparts compete with adults. Tournaments range from double-elimination and round robin to "Warlord" tourneys, where youth fighters captain teams of other fighters in melee battles. 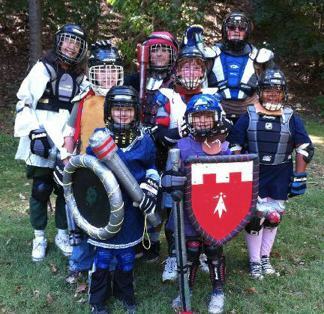 There are even tournaments to determine Baronial and Kingdom Youth Combat Champions, who serve as honor guards for their Baron and Baroness or King and Queen. 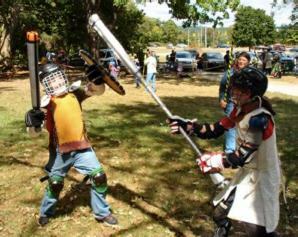 At the Pennsic War, youth fighters compete in practices, tournaments, and a castle battle with dozens of fighters in each division. 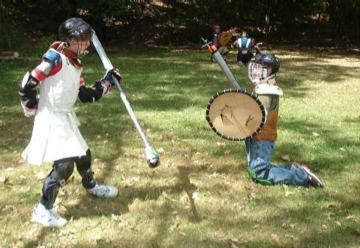 Youth combat practices are held on Sunday afternoons from 2:00pm to 5:00pm at the same site as adult fighter practice. Warm weather (approx. Apr – mid Nov): Washington Blvd. Cold weather (approx. mid Nov through Mar): Pittsburgh Chinese Church, 8711 Old Perry Hwy, Pittsburgh, PA 15237. Parking: Park in the down-slope lot off of Highland Rd, walk around the side of the building, enter the first door, and walk up the stairs to the room on the 3rd floor. Helpful picture here (entrance at the green arrow). Doors open no earlier than 2pm. For more information about the youth combat program in the Debatable Lands, contact the Youth Combat Marshal. 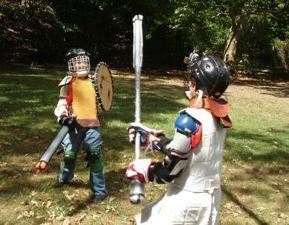 Two Division 2 youth fighters face off: a 12-year-old with sword and shield, and an 11-year-old with a polearm. The shield man blocks a blow from the polearm with his shield. The sword and shield fighter has taken a blow to a leg, so he must fight from his knees. The polearm fighter took a blow to his right arm, so he must fight using only his left arm. Who will win? The shield man has taken a blow to the head and "died." Don't worry, he's just pretending to be dead — he's actually fine, and will get up and fight again. Here he demonstrates the correct position to "die defensively." It's important to use this position, especially in a melee, to ensure that you don't get hurt if other fighters trip or fall over you.